GAP has spring sale items for up to 70% off. Take an extra 40% off with code "SPRING". Save extra 10% off w/code "HAPPY". Shipping is free on orders $50+. Deal ends 4/22. @GAP. Shipping is free with $50 (before discount). 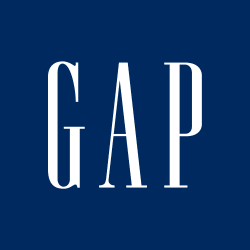 Extra 50% Off Sale with code "FLASH"
Or Extra 40% Off sitewide with code "APRIL"
GAP is offering an extra 45% off everything online with promo code "CYBER" (including sale and last-chance items). Shipping is free on orders $50+. Deal ends 4/10. Gap has 40% off and free shipping on orders $25+ with code STYLE (works pre discount). Save an additional 10% with code ALSO. GAP has 40% Off Everything with code "STYLE". Shipping is free with $25 purchase. Gap discounts a selection of men's, women's and kids' items as part of its Mystery Deals, with prices starting from $5. Shipping adds $7, but orders of $50 or more receive free shipping. Kids' flip-flops start from $5, men's T-shirts from $10, and women's tank tops from $8. GAP has 40% Off Everything (c:FRIEND). Shipping is free with $50 purchase. Gap cardholders get extra 10% off with code "PLUS10"
Gap.com [gap.com] is offering 40% Off Sitewide w/ promo code BIGUPS plus an Extra 10% Off w/ promo code ALLYOU. Shipping is free on orders $50+ (pre-discount). GAP is offering Extra 40% off Everything, including denim w/ Code "BIGUPS". Plus, take an Extra 10% off w/ Code "ALLYOU". Shipping is free on orders $50+. Deal ends 03/06/19. GAP is offering an extra 40% off everything, including denim with promo code "GREAT". Plus, take an extra 10% off with promo code "BOOST". Shipping is free on orders $50+. Deal ends 2/18. Gap Cardholders use code GETMORE to take 50% off select sale [gap.com] items below. Use code BDAYFEB to take an additional 25% off. Shipping is free $50+ pre coupon codes. More GETMORE Items [gap.com] - Note GETMORE is not a sitewide code, it only applies to items in the links provided. GAP has Up to 50% Off Sitewide. Shipping is free with $50 purchase (before discount). Plus, Extra 50% off Sale Styles w/ Code "GETMORE", applies to merchandise with price ending in .99 and .97. GAP has Up to 75% Off Sale. Plus, Extra 50% off Sale Styles w/ Code "GETMORE". Shipping is free with $50 purchase (before discount). Ending today, Gap takes an extra 50% off sale styles, already marked up to 75% off, via coupon code "CHILL". Alternatively, take an extra 40% off everything else. Shipping adds $7, although orders of $50 or more bag free shipping. Some exclusions apply. GAP has Up to 75% Off Sale. Plus, Extra 50% off Sale Styles w/ Code "CHILL". Shipping is free with $50 purchase (before discount). Shop All (40% Off Everything with Code "COOL"
GAP has Up to 75% Off Sale. Plus, Extra 40% off Everything w/ Code "BREAK" and Extra 10% Off Sale with code "BONUS". Shipping is free with $50 purchase (before discount).